My name is Sarah Hiner and I am the Pastoral Support Lead at Phil and Jim. 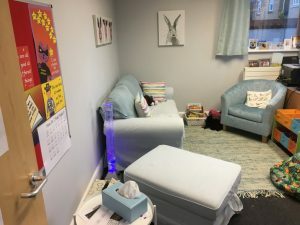 The PLACE TO BE is a warm, calm and comfortable space for children, parents and staff to come and talk or just sit in a peaceful environment. This room (also my Office) has become a very busy room and children can access it at any time during my working hours. I see a lot of children at play times with friendship upsets, others have worries that they want to talk over or feelings they want to explore and sometimes things happen at home that they want to talk about. As well as academic teaching, we realise that the children’s mental health is a very important factor in their development and so we need to help them navigate and understand their emotions and well-being. The PLACE TO BE is open every Monday to Thursday from 8.30am – 1.30pm. If I’m not in, there is a post box, paper and a pencil outside the door so children can leave me a message. On my return, I will then go and collect them from class and talk through the problem with them. 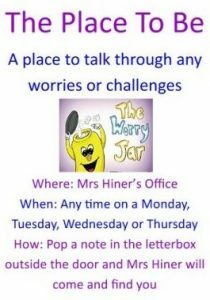 The PLACE TO BE isn’t a “secret place” – if I have any concerns or need to talk over anything with you, I will of course give you a ring. 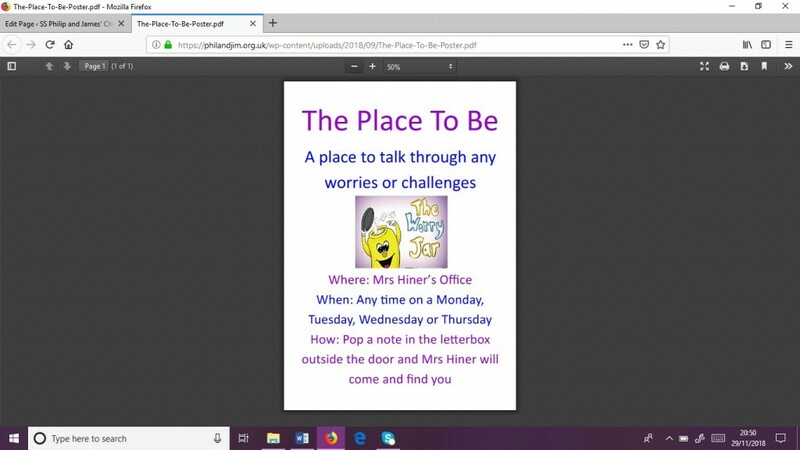 If you want to come and talk to me, you can either: ask at the Office, email me on sarahhiner@ss-philip-and-james.oxon.sch.uk, ring/text me on my school mobile (07824499679) or ring the school office to leave me a message.